Prime Minister (PM) Tun Dr Mahathir Mohamad said Malaysia’s priority presently is not to build a high-speed train network, but to improve the quality of existing railway services. The PM said it is not worthwhile to have an HSR for short journeys, but instead may consider such super fast train to operate from Johor Baru to Penang or even the Thai border. Okay, fine, no KL-Singapore Shinkansen for us anytime soon. I believe a bullet train between the two cities would likely be profitable as well as good for the environment as a lot of jet fuel could be saved if we can cut down the number of flights. What to do. The current government prefers to revive the ECRL instead. I do wonder why though, because the suspension of both projects cost lots of money. Maybe the government was trying to salvage our relations with China, which is the main player of the ECRL project. That's after all that talks about the previous government trying to sell the country to Beijing. Whatever it is, I think the Japanese may not be very happy about this because at one time I believe they almost got the HSR project. Especially after they gave us the samurai debt and other nice gestures. Personally, I prefer the HSR over the ECRL because it would make my trips to Singapore much easier. I'm actually not all that excited about the ECRL project since it was first conceived because I can't see much urgent need for it. Quite packed. Almost like in Japan. 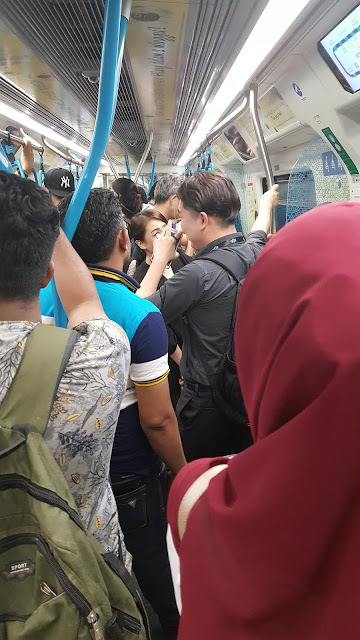 I believe the LRT units are even more crowded these days, especially during rush hour. Hopefully, the government will one day consider improving the rail transport in Klang Valley as being more urgent as it serves mainly the common people. But then again maybe reviving projects like ECRL would open up more business opportunities for "certain people" unlike MRT or HSR. Maybe we will have to wait till the end of this term before we can get better public transport in the Klang Valley. "Why so cautious? Tell me, who actually won the spat? Why you said you don't have good feeling about this new MB?" - Why no one send the MB candidate name/names to the Johor palace? Remember, Muhyiddin did so after the general election last year. Why was the convention broken? Muhyiddin having an audience with Sultan Ibrahim at the Istana Pasir Pelangi in Johor Baru on May 11 last year to present names of Pakatan's candidates for the MB post. - Why did the Johor palace immediately accept Dr Sahruddin as the new MB? It was all so smooth and in fact very quickly done. If it's a war, I would like to call it the Johor blitzkrieg. Very brilliant, actually. Also bear in mind that the palace insisted that the new MB will be loyal to Johor. - Why was Osman Sapian not distressed by much after he was removed from his MB post? Really. The guy went on almost as usual after Dr Mahathir announced his resignation. As a friend at Kota Iskandar said to me "MB selamba rock je". - Who is Dr Sahruddin in Johor Pribumi Bersatu? Which camp does he belongs to? Who is his mentor? Who quarreled with Muhyiddin to get him fielded in Bukit Kepong during GE14? Why do the Johor DAP people like him? I have the answers but if they come from me, you all will not be happy and accuse me of being an Umno cybertrooper and what not. So, you all go and find out yourselves. Ask around la. Well, as far as I'm concerned, I believe it's going to be business as usual in Johor. I know, I know....I'm no longer based in Johor, thus not good enough to tell stories about Johor. Just wait la another year. See whether I got it right again as I did last year about Osman Sapian. Yup, and Dr Mahathir may no longer be PM at that time next year to get Johor a new MB. I don't think Anwar will really bother. p.s Watch out for what's going to happen to Mazlan Bujang in the coming Johor exco reshuffle. "Another one term MB, the most." Well, actually the guy is not even going to be a one term MB because he took over from Osman Sapian in mid-term. But never mind that as I just want to emphasis my belief that he's not likely going to survive another election at his constituency of Bukit Kepong. 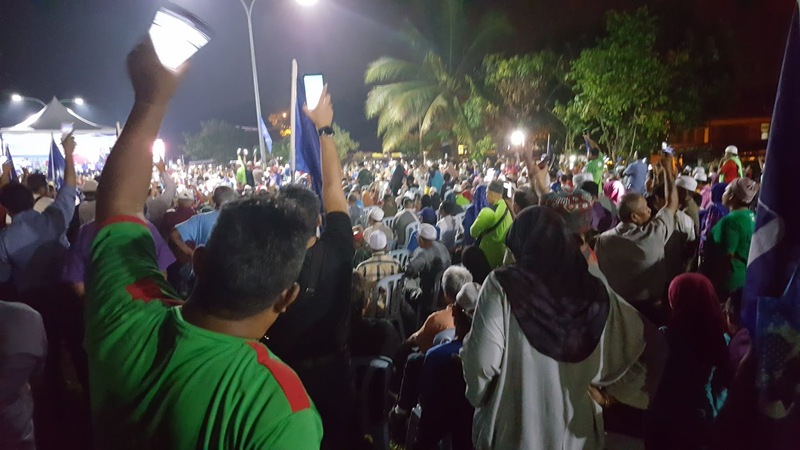 With BN, in particular Umno on the march again now, combined with their cooperation with Pas, constituencies such as Bukit Kepong, with almost 70 per cent Malay voters, are almost certain not going to be safe places for Pakatan candidates. If BN had combined with Pas last year in Bukit Kepong the way they are now, Dr Sharuddin would not have won his seat. Well, maybe Pakatan will move Dr Sahruddin to a Chinese majority area for the next election to save their MB. Yup, that's despite him being a Pribumi Bersatu guy, who is supposed to win over the Malays. As for now, Dr Sahruddin needs to survive as MB longer than Osman Sapian's 11 months. Otherwise, it's going to be super difficult for the current Johor Pakatan establishment. Actually, I don't know much about the guy except for what I was told by my sources in JB. They told me that he's rather quiet, blur blur a bit but seemed to be enthusiastic about his work. 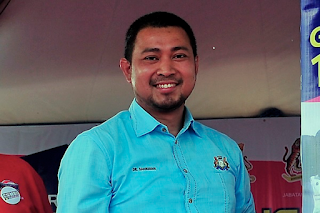 He was said to have done well in managing the Sungai Kim Kim issue, particularly in communicating with the stakeholders on what were being done to handle the issue. The guy is a doctor who used to run a GP clinic....you know, the type where you go to if you are not feeling very well and need an MC. He's a graduate of some sort of a university in Indonesia.....errr, are doctors from Indonesia any good? Maybe they are. Still, overall, the guy sounds decent enough to me. But then again, to be a Johor MB, being just decent may not be good enough. One must have a vision of what should be done to further improve the state and at the same time command the respect of all quarters in Johor. I'm not sure if this Dr Sahruddin, at 43 have enough experience and clout for all that. Even the sacked Osman Sapian has three terms as state assemblyman before becoming MB. And he is quite senior compared to the other Pakatan leaders in Johor. And of course there's that big question of whether this new MB can manage the difficult relations of Kota Iskandar-Johor Palace-Putrajaya. Honestly, I don't envy this Dr Sahruddin. Trust me, this is going to be the most difficult one for the guy. He may ends up being squished in the middle. But then again, who knows, the guy may prove himself to be a superman....mild mannered doctor in daytime, superhero at night.....something like that. Of course Dr Mahathir has another option - he can turn the Johor MB post into a disposable MB post. He can change the guy less than a year from now like Osman if the young doctor fails to satisfy him. The same with the next one. I think Pribumi Bersatu have enough assemblymen in Johor for that till the next general election. Osman, who won in Kempas is not going to be a good Johor MB. If you all don't believe me, please double check with others who know Johor politics. Obviously, they didn't bother to check and ended up taking almost a year to realise it. Sigh. Well, I actually have a bad feeling about this new MB too, but I rather let it be. I'm not going to give free advice to Pakatan on this matter anymore. Wasting time only. Yes, BN won at 13 of the 14 PDMs (voting centers). The only place where PH won was at Bandar Ekar. 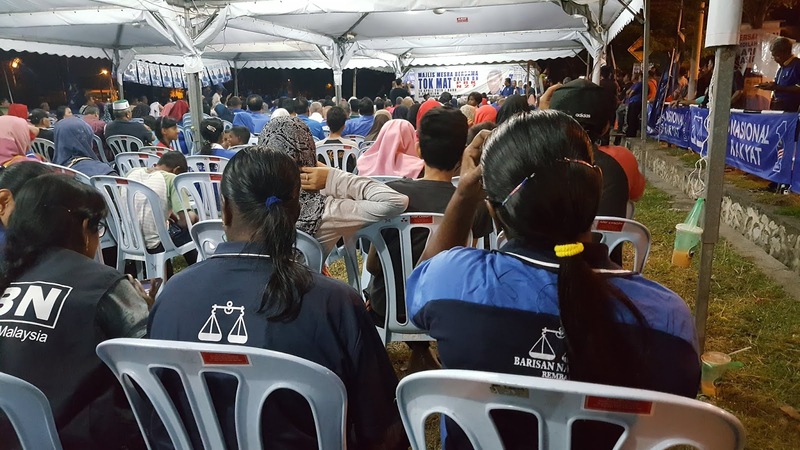 This is BN's third consecutive victory after Cameron Highlands and Semenyih. A clear sign that the tide is really turning. Congratulations to BN and Mat Hasan in particular. I'm quite sure there will be more all the way to the next general election. I arrived in Rantau a bit late today. The GPS told me to go through an alternative route exiting the Elite Highway at KLIA and I have to go through a winding trunk road to Lukut. From there it was another 20 minutes to Rantau. When I arrived at the outskirts of Rantau town just before noon, the road was choked with vehicles. Stopped at a warung for lunch before taking a walk around Rantau town. Everything was fine and the polling process seemed smooth as I observed at Sek Keb Datuk Akhir Zaman. I rested for a while at the MCA operation centre as it was very hot at that time. This time I have a bottle of 100 Plus. I even bought some very sweet "Indian candy" at a nearby stall just in case I need some extra sugar intake. The MCA people were nice to me. I talked to one of the party workers and asked about BN's chances and she said it's 50-50. She said she would be happy if BN can get even just 10 per cent of the Chinese votes. "But we have to continue to tell them that there must be a check and balance for the government," she added. I'm now taking a rest at a hotel in Seremban. Will go back to Rantau before the counting of votes begins. I will update this post once the result of the by-election has been announced. I actually feel like writing more about the Putrajaya-Johor spat today, but the Rantau by-election is going to be tomorrow. So, I think I better focus on Rantau first. I was at the BN rally in Taman Angsamas last night. Pas president DS Abdul Hadi Awang was there. The guy was just discharged from IJN four days previously. The venue was packed and many can't find themselves a seat. I ended up sitting by a drain at the edge of the venue. They are doing some sort of concert things with their phone in between speeches. The speeches were relatively good and the crowd was enthusiastic. Even Hadi whom I guess was still not fully recovered from his ailment sounded upbeat and last night he became the first Pas president to lead a prayer for a BN victory. Mat Hasan was his usual self. He's quite good at explaining complicated things to the crowd consisting mostly ordinary people. Even his jokes were all quite funny. This Chinese lady with her son turned up in front of me when Mat Hassan started his speech and left only after he finished it. I don't think I need to tell you all what were said at the ceramah as they are all over YouTube by now. By the time the ceramah ended, I was very tired. The heat and humidity was quite taxing for me. I should have brought a bottle of 100 Plus. Driving back to KL added to my exhaustion and I only arrived home about 1am. I'm definitely not as strong as I used to be. Today, except for my usual work, I'm saving my energy for one last trip there before the polls. Whatever it is, I would be very surprised if BN loses in Rantau after last night. The mood was really good for BN. See lah tomorrow how it's going to be. 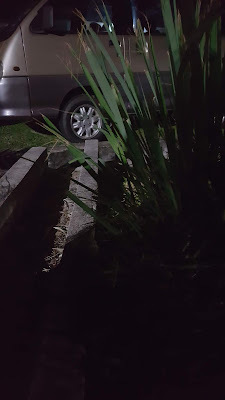 I was sitting next to this lemongrass shrub by a drain last night. They were clapping enthusiastically when it was the turn of BN candidate Mat Hassan to deliver his speech. Earlier, I talked a bit with one of them and she turned out to be a resident of the housing estate. She said her friends are also locals. From what she told me, Mat Hassan really shouldn't worry about getting votes from the Indian community as he had done a lot for them in the 14 years he was the Negeri Sembilan MB and Rantau assemblyman. Well, that's good news for Mat Hassan. I know that many BN supporters were worried that their candidate may not get votes from the non-Malays but in this case I believe that Mat Hassan is going to get quite a lot of votes from among the Indian voters in Rantau. In fact, I think Mat Hassan may even get quite a few votes from among the Chinese voters too. 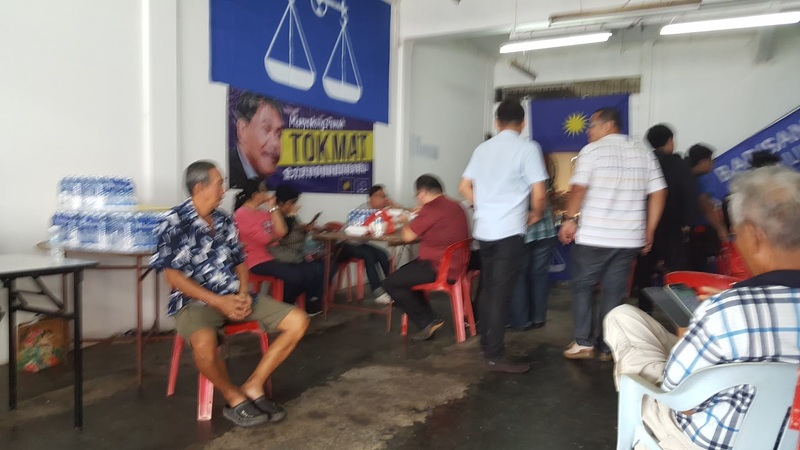 The demographics of the Rantau constituency is Malay 53.43%; Chinese 18.81%; Indian 27.01%; B/P Sabah 0.18%; B/P Sarawak 0.13%; Orang Asli (Pen. Msia) 0.01%; Others 0.42%. Mat Hassan's speech last night was rather normal. I have seen similar speeches by him at YouTube. 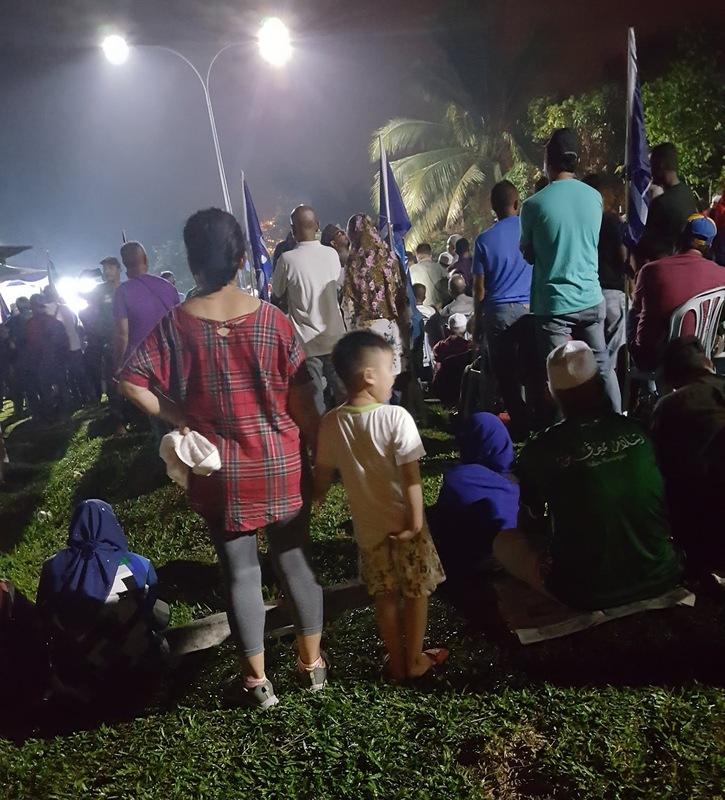 So, I decided not to wait for the end of his speech and left for Rantau town where Anwar Ibrahim was having his ceramah. There was quite a bit of jam as the ceramah was held in the middle of town. I only caught the tail end of his speech and even that was from the car while stuck in the jam. Anwar was shouting "reformasi" for the closing of his speech which I found awkward. His side is the government now la. What reformasi he was shouting for? I'm going to Rantau again later today.